Mondelēz International has announced a new commitment to make all packaging recyclable and provide recycling information by 2025. The company will work in partnerships so that packaging can be collected and recycled in markets around the world.This new commitment is part of the company’s strategy for a circular packaging economy and will help deliver its long-term vision for zero-net waste packaging. The announcement reflects the company’s new purpose to empower people to snack right by offering the right snack, at the right time, in the right way. This includes ensuring that the company’s products are made with ingredients that are sustainably sourced, produced and delivered, with positive impact along the supply chain. 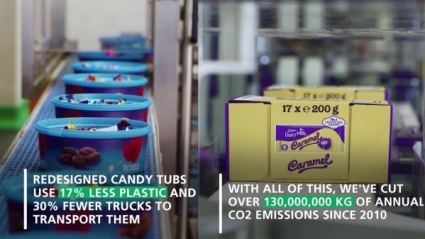 In the U.K.,Cadbury Heroes tubs were redesigned to use 17 percent less plastic resulting in 30 percent fewer trucks to transport them. In Asia, Middle East and Africa,improvements to secondary packs and shippers for chocolate products saved more than 1 million kg of corrugated paper. In the U.S.,Oreo cookies packaging were made 23 percent thinner, which reduced the need for nearly 1.5 million kg of cartons annually.